I was recently at Tokyo Game Show. You know what that means, right? Yep: More strange Kit-Kats from abroad. Sometimes you win, sometimes you lose. Sometimes you lose spectacularly and even after you raise the white flag they keep pummeling you with attacks and you explode horribly and die. This is one of those cases. Daigaku imo flavor Kit-Kat is one of those things that makes me realize I really don’t understand Japan on, like, a genetic level. Who over there thought it would be a good idea to make a candy bar that tastes like potato? It’s not like those zany Thanksgiving Jones Soda packs where they make soda that tastes entirely like savory foods; instead, it’s basically a white chocolate Kit-Kat that’s been bizarrely modified to also be sort of rich and savory. It’s really not especially tasty. As often happens with these oversized chunky-style Kit-Kats, its problems are compounded by its size: The freakishly mutated white chocolate is really thick around the lower portion, so the sickly savory-sweetness assaults your tastebuds like the forced goose-step march of an army made entirely of gross. Anyway, I don’t recommend this one. Unless you’re Japanese, in which case you might enjoy it? I don’t know. Japanese cuisine is mostly delicious, but they do occasionally give us things that throw the human tongue for a loop. This isn’t, you know, natto or anything, but still… advance with caution. 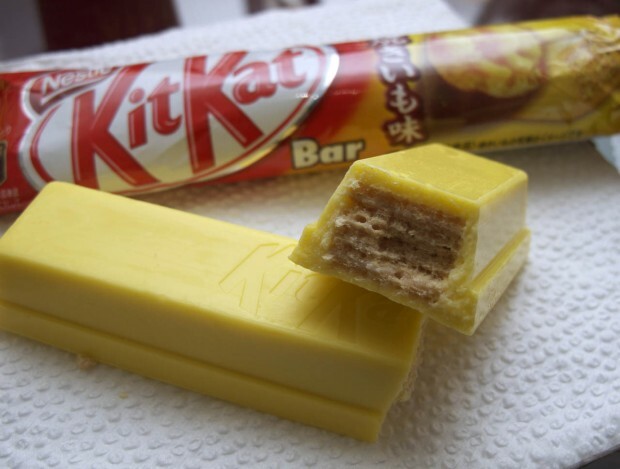 This entry was posted in BakeSpite, Kit-Kat Densetsu and tagged kit kat. Bookmark the permalink. When will natto Kit Kat be made? Actual Daigaku imo isn’t very good either, so a Kit-Kat imitating it is bound to fail. From what I understand (or what my fiance told me, who’s from Japan), these wacky flavors aren’t particularly common or popular? Either way, however temporary, this sounds pretty awful. I like Jones Soda, but I’ve never tried any of the Thanksgiving flavors… what’s the verdict? There are a whole lot of special flavors, but they’re mostly sold at souvenir shops, rather than convenience or grocery stores. Doesn’t it say Yaki Imo on that package?